I love mushrooms and this little tapas is a winner to go with a glass of wine while you sit in front of your crackling fireplace (or any other time). One of the things we do every year on the day AFTER Thanksgiving is to have our family “feast”. We have been doing this for almost eight years now. We have another couple and their family come over and with our three kids and two of their spouses, we have a blast cooking. This is just one of our tapas we did last year. This is an open faced Fontina Melt. I call it Balsamic Mushroom Panini. The mushrooms sauteeing with the butter and olive oil gives off the best aroma. The baguettes (or bread) gets spread with mascarpone cheese and topped with sliced fontina. 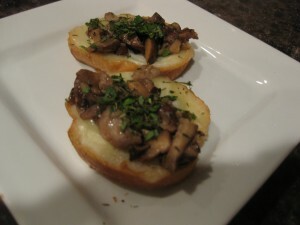 Then these get toasted on the panini, pulled apart and topped with the sauteed mushrooms. 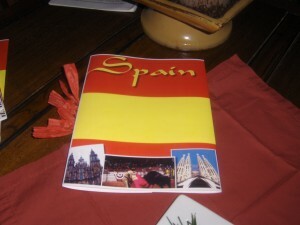 This is the menu from our Spanish Tapas Feast last year. The menu has everything listed that we cooked and who was in charge of making the dish. We have had themes such as “all oysters” (7 ways), sushi, Mexican, Italian (After our trip to Italy, we were inspired to do an Italian theme), we have had French Country and last year we did Spanish Tapas. Everyone is in charge of choosing one (or more) recipes to try. My daughter-in-law, Brooke, puts together the menus so everyone has a copy and we set about making our recipe for the evening. 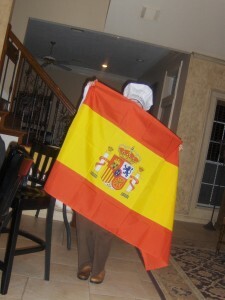 We had a Spanish flag last year to go with our Spanish Tapas theme and everyone got their picture made with the flag either in their chef’s hat or holding some utensil or food. Someone is hiding behind the flag and that may be me. We had all Spanish wines. This recipe was out of a panini book I have and if you don’t have a panini grill, then you can just toast the bread on one side and finish this off in the oven. 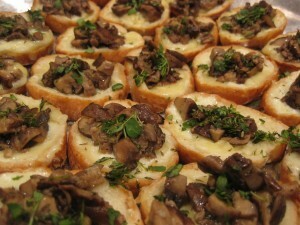 They are delicious and I’m going to try a variation of this using puffed pastry and adding some asparagus as a garnish. Hope you enjoy these as much as we did. 1/4 c. extra virgin olive oil, plus 3 Tbsp. Preheat panini grill to high heat. In a large skillet over medium-high heat, melt the butter and add 3 Tbsp. olive oil. Wen hot, add 4 cloves minced garlic and bella and shitake mushrooms. Saute for 3 minutes, then add thyme, pepper, salt and balsamic vinegar and cook for 3 additional minutes or until mushrooms are tender but not soft. Remove from heat and set aside. Combine remaining minced garlic with remaining olive oil in a small bowl. Brush one side of 8 slices of bread with olive oil/garlic mixture. Spread mascarpone cheese evenly on the inside of 8 slices of bread, then top with 4 slices fontina cheese. 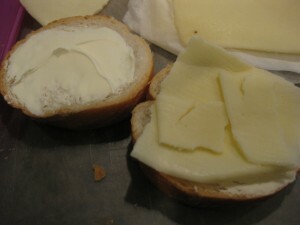 Place fontina topped slices oiled side down on panini grill, then top with remaining slices of bread, oiled side up. Close panini grill and cook until golden brown and the cheese is melted, about 10 minutes. Remove from grill and pull sandwiches apart, leaving cheese on both sides. 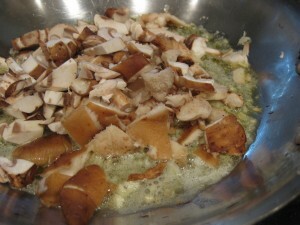 Lay out on serving dish and top each with mushrooms mixture. Garnish with more fresh thyme. Serve warm. *Note– sometimes I use a mixture of 3-4 kinds of mushrooms. These look wonderful. 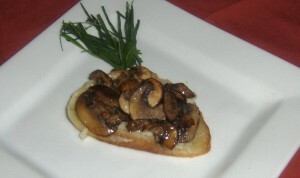 I love shiitake mushrooms and think fontina is the very best melting cheese! What a great dinner party idea! Love the little paninis– perfect fall fare! Looks fantastic, I love paninis! We have been doing a weekly tapas at our house for years! I am so excited to give your paninis a try, they sound amazing.